Stamp Desriptions 40p - C.Samaritan Jo™ Evipo075N.53p - C.Anna Louise™ EvithreeN.55p - C.Chelsea™ Evipo100N.63p - C.Edda™ Evipo074N.71p - C.The Countess of Wessex™ Evipo073N.79p - C.Giselle™ Evipo051..
Raymond Evision is celebrating 25 years of Gold award from the Chelsea Flower Show, our prestige booklet contains four sets of these fabulous stamps in beautifully illustrated panes. There is a wealt.. Some of our stamp issues are produced in sheets of ten. 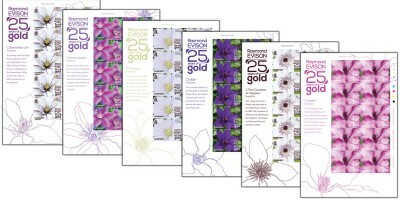 This enables collectors to obtain cost-effective sheets of each value with the name of the designer, printer and printer's information and ‘traf..
Raymond J. Evison OBE, VMH, is a nurseryman, lecturer, author and photographer. Born to a gardening family in 1944, his horticultural career began at the age of 15 at Treasures of Tenbury Ltd in Shropshire, England; just eight years later he became managing director. 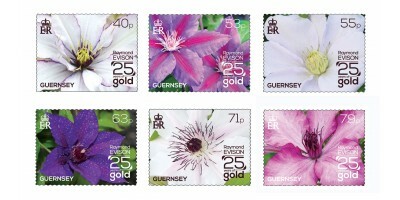 Drawn by its climate, Raymond moved clematis production to the island of Guernsey in 1985. The Guernsey Clematis Nursery Ltd was formed that same year and has proved to be a hugely successful venture, as the nursery produces up to a quarter of the world's annual requirement of young clematis plants. Raymond, who moved to Guernsey in 1987, has bred and developed more than 100 clematis cultivars (hybrids) and has probably introduced more than anyone else worldwide. 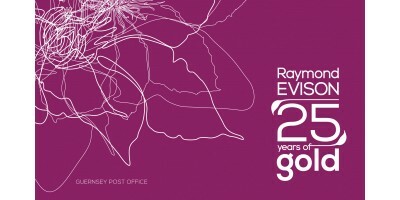 Over the years Raymond has had many successes at The Chelsea Flower Show and, in 2013, he received his 25th gold medal for exhibits of clematis - his 11th consecutive gold medal at the world renowned flower show. He has also won two Lawrence Medals and six Williams Memorial Medals for exhibits of clematis at Chelsea, as well as other gold medals at the Hampton Court Palace Flower Show. In 2013, he exhibited 50 different varieties at the Chelsea show, all of which were raised in his famous Guernsey nursery, something rarely done - if at all - by any other exhibitor. 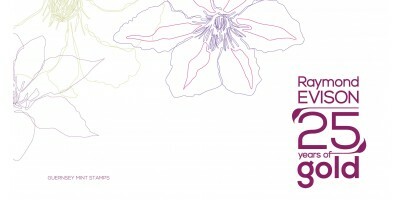 In celebration of his achievements our special issue 25 Years of Gold features five of the clematis that Raymond exhibited at the highly successful 2013 Chelsea Flower Show, namely, Anna Louise, Chelsea, Giselle, Samaritan Jo and The Countess of Wessex. 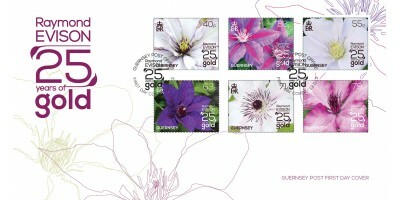 Completing the set is a stamp depicting clematis Edda, which is to be launched at the 2014 show.